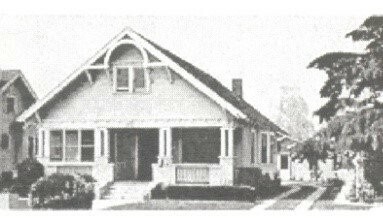 The home, which has suffered fire damage was constructed between 1915 and 1925, was a fine home in its era. Over the years, it has seen several improvements, as well as a conversion of use. The interior has recently been converted to a half-way house, which would be similar in design to a bed and breakfast. The exterior has received a new metal roof, vinyl siding to the walls and a general spruce up. Although the exterior was well hidden with the vinyl siding, some areas indicate that the sheathing is rotten from water damage penetrating it from the exterior, thus resulting in poor condition. It is in our opinion that the existing basement was added in the sixties which added approximately 4 feet to the ceiling height in the basement. It probably was finished at that time for recreation purposes. However, we must point out that the entire structure has not been totally damaged and there is some sound building components left undamaged. Some just need some cleaning and treatment. The opening photo represents the quality of original construction. The current Assessment Authority assessment for improvements shows $59,900 below. It is our opinion, subject to a co-insurance penalty, that the actual cash value for this loss is $67,838.68 which represents 37% of the $178,522.86 bid by the Restoration Company if they are going to restore the building prior to the loss and not to reconstruct the whole building. If they are not going to restore the building, we would suggest that the cash out amount be adjusted to reflect no overhead or profit on the repairs for the same bid. $137,887.42 plus GST of $9,651.41 for a sub total of $147,538.83 less the depreciated amount of $92,949.46 equals total cash out of $54,589.37. In summary, the $59,900 by the Assessment Authority is the real value of the improvements based upon actual use and not reproduction costs. Thus the $178,538.83 represents the repairs of the building to put it back in the same condition it was before the loss and not the reproduction cost of the building. So by comparison the Actual Cash Value of $59,900 shown on the assessment notice is close to the Actual Cash Value of $ 54,589.37 for a partial loss in this case, and the Improvements shown on the assessment notice should not be used in a situation that has only a partial loss. As in this case it is only coincidental.